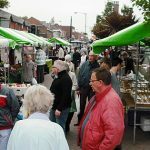 Harborne is a thriving and prosperous Victorian suburb with a large stock of housing dating from pre-1900 found mainly around the High Street, and the early 20th century. The oldest part of what is known locally as ‘Harborne Village’ is centred on St Peter’s Church, (Church of England), Old Church Road, which dates from Anglo-Saxontimes (St Chad preached there) and whose tower was (re)constructed in the 14th century. As a non-Quaker area of the city, Harborne became well-supplied with public houses compared to nearby areas such as Edgbaston and Bournville. There is a famous “Harborne Run” pub crawl consisting of from 10 to 15 pubs (the agreed itinerary varies). The spelling of Harborne has appeared with several variations through the centuries, and the derivation of the place name has often been disputed. One of the more probable suggestions is ‘boundary brook’, although ‘high brow’ and ‘dirty brook’ are also possibilities. St Mary’s Church was the first Roman Catholic congregation formed by the Passionists who worshiped in a disused Methodist Chapel on Harborne High Street from 1870. Building work started on the current church, in Vivian Road, on 8 September 1875 and it opened on 6 February 1877. The Augustinians (Austin Friars) arrived at St Mary’s in 1973 to a growing catholic population and work on a new church, attached to the side of the old church, started on 1 August 1977 and was finished in 56 weeks. The St Mary’s Parish Centre was opened in 1990 and is next door to the church. Harborne became part of the county borough of Birmingham and thus transferred from Staffordshire to Warwickshire in 1891 by the Local Govt. Bd.’s Prov. Orders Conf. (No. 13) Act, 54 & 55 Vic. c. 161 (local act). It then became part of the West Midlands in 1974 by the Local Government Act 1972.